In July 3, many Niger actors, who dressed in traditional national costumes, brought a wonderful song and dance performance in the World Expo Park. The show displayed the original and modern blend of West African style, and expressed Niger people’s aspirations to pursue a better life. Niger is located in western Africa, which is one of the world’s hottest countries. 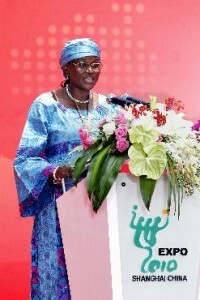 July 3 is Niger pavilion day, so Deputy Secretary of Niger Department for Business, Industry and Young Entrepreneurs Ms Mariama attended the ceremony and delivered a speech. Ms Mariama said that July 3 is not only the day of Niger Pavilion but also the 50th anniversary of independence of Niger. 2010 shanghai world expo is an unforgettable expo, and we hope it can enhance the win-win cooperation between the two countries in future. This entry was posted on Thursday, August 5th, 2010 at 11:35 am	and is filed under Expo News. You can follow any responses to this entry through the RSS 2.0 feed. Both comments and pings are currently closed.